Is Video Streaming Straining Your Corporate Network? Is Video Straining Your Network? A video content management system (video CMS, or “corporate YouTube”) can help address these issues. How? First, video CMSs often stream videos using chunked (stateless) delivery. This enables video content to work well with caching proxies that many organizations deploy across their WANs. For frequently accessed videos and simultaneously accessed live events, the ability to use a WAN’s caching framework can substantially reduce overall bandwidth consumption. Video content management systems typically use adaptive bitrate streaming to serve live and on-demand content. With adaptive bitrate streaming, the video CMS detects a viewer’s bandwidth in real time and adjusts the video quality accordingly (see below for an illustration). To do this, the video CMS uses an encoder (typically installed on the server) to take a single-bitrate video as input, and encode it to multiple bit rates. For viewers, this results in minimal buffering during playback, faster start time, and a good experience for both high- and low-bandwidth connections. quality during playback based on available bandwidth. Most video CMSs offer deployment options that can offload a portion of video content from the corporate network. For internal-facing video such as all-hands events, training, and employee-generated video, an on-premises instance of the video CMS would be deployed to corporate servers. For external-facing content such as marketing and customer support videos, a cloud-based instance of the video CMS would be hosted by the video CMS vendor. This hybrid option would reduce the load on the internal network for external content and ensure high global availability through integration with enterprise content delivery networks (ECDNs) such as Kollective. Finally, video content management systems can help existing corporate video conferences achieve greater scale while reducing the load on the network. Popular video conferencing solutions such as Zoom, BlueJeans, Skype For Business, and GoToWebinar reach scalability limits between 500 and 1500 participants. By contrast, live webcasts delivered through a video CMS can viewed by tens of thousands of viewers simultaneously. Because most video conferencing participants are passive viewers, the video conferencing stream could be routed through a video CMS to reach the desired scale while taking advantage of adaptive bitrate streaming and other bandwidth management capabilities of the video CMS. Want to know more about video content management systems and why every IT organization should have one? 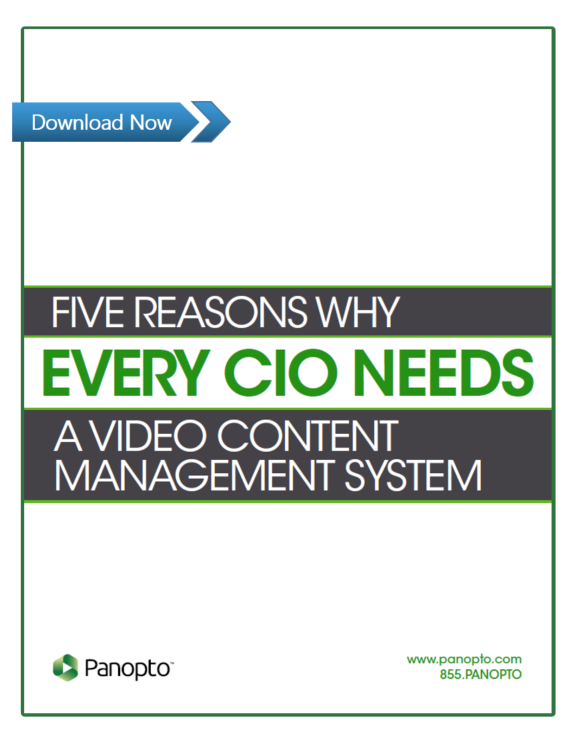 Download our latest free white paper, “5 Reasons Why Every CIO Needs A Video Content Management System” today.